You can now buy quality Hudson sprayers and parts on this site! If you see a price on an item, you can add it to your cart and complete your purchase today. This site isn’t an exhaustive list of all products, so there may be something you can’t find like a particular part for your trusty sprayer that has lasted for many years. If this is the case, please contact us and we’ll look into sourcing it for you. To find a part for your existing sprayer, check to see if the sprayer is on this site. If it is, you’ll be able to download and view a schematic of it – a simple ‘exploded view’ drawing of all the parts used in its construction. When you find the part you need, note the part number and search for it to see if we have it listed. If it has a price, you can buy it today, however if no price is listed or we don’t have it on this site, contact us so we can try to obtain it for you. Remember that Hudson maintenance kits contain many of the parts used in our sprayers; the Universal Service and Maintenance Kit contains parts to repair over 90% of Hudson sprayers and may even upgrade existing components. You can buy sprayers and parts on this site and pay with peace-of-mind through PayPal, the safe, easy way to pay on-line. You don’t need to have a PayPal account, you can still pay using a credit card. 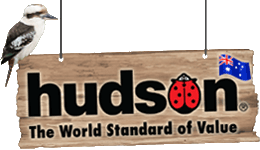 Payments will be made to Master Distributors, the Australian and New Zealand distributors of Hudson products. PayPal uses the latest in data encryption and anti-fraud technology to help keep your information secure and reduce the risk of on-line fraud. Our delivery service within Australia will work to get your sprayers and parts to you as quickly as possible. It can take two and five business days to east-coast metro areas, and seven business days to the rest of Australia. This excludes weekends and public holidays. Orders are dispatched either through Australia Post or a courier, depending on the product and size of your order. If you are not at home when your delivery is attempted, the delivery company will either leave your order in a safe place near your front door out of direct view, or a card will be left telling you how you can collect your order. Purchase items totalling $150 and over and your delivery is FREE! This will be shown in your shopping cart and checkout.